After you create a Gamestar Mechanic class, it appears in your workshop with a few more options than what your students see. You can use these options to monitor the progress of your students. When you click this button, the Class Profile page appears. There you can see or change many universal features of your class. Class Name: The name that’s displayed for your class. Class Shortname: A series of letters and numbers (no spaces) that’s used in activation links. The most convenient setting for it is your class name with spaces omitted. Auto-Following: When enabled, lets all your students automatically follow each other, giving them updates on each other’s work in the News Feed. Collect Real Student Names: This requires new students to enter their full names to join the class. Unlock All Sprites: Grants a large number of sprites to everyone who joins the class so that they don’t have to complete the Quest. It also includes three sprites that are otherwise unobtainable: the Monitor and Book transmogrifier skins (new textures for the Transmogrifier sprite) and the Tombstone (a spooky, destructible block). Quick Join Links: Provides links for joining the class, which you may distribute to your students. Apply Premium Pack gives students a Premium pack for your class. Remove from Class takes away their membership in your class, placing them on the Removed Students list. The blue Need More Premium Student Packs link takes you to a page where you can buy more packs for your students. Remove from Class moves them to the Removed Students list (but it does not mean that you can reallocate their Premium packs). Report Abuse reports users who took Premium packs when they shouldn’t have. Removed Students: A list of students who were once in your class but have since been removed. These students have no access to class features. You can select students and click the orange Return to Class button at the bottom to reinstate their memberships. 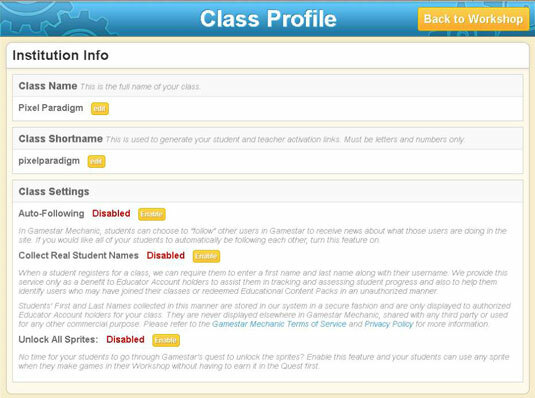 The Student Tracking option displays the names of all students in your class along with their statistics, such as number of published games, draft games, reviews, and Quest missions completed. It’s a helpful way to find out how your students are using the site. Add new projects: Click the Add New Project button to design a project from scratch. View your projects in a vertical list: This arrangement makes it easy to see all your projects, along with options for editing them. Edit and delete projects: Use the buttons to the right of your projects to edit them. The Student Discussions page shows the reviews and comments that your students have left on other games. Gamestar Mechanic has no built-in chat system, so the only on-site student discussion is by way of these reviews and comments — students usually communicate directly in person or over social media. Use this section to view your students’ progress in game design and media literacy through the context of Gamestar’s extensive game database.